Bank executives with the wrong culture will be trying not to laugh at the recommendations. Some are calling it a waste of time. I think not (see below). There is no separation of banking from financial advice which was the worst case scenario for the sector. The sector has escaped material road blocks to "business as usual". The short positions in the banks are likely to unwind – there is a good chance that the publication of these recommendations marks the bottom of bank sector sentiment – I am hoping so anyway. These are important investments for many investors, particularly retirees, and they should benefit from the relief. The Hayne recommendations will not materially disturb their profitability and the new 'certainty' should lift sentiment. In hindsight the Hayne Royal commission was never going to have the time needed to forensically investigate the sector to the satisfaction of everybody and they haven’t. There is some criticism that they missed a lot of issues and spent too long focusing on “fee for no service” and the sales/profit culture and in so doing missed a host of other issues such as (this list is off Cuffelinks) performance reporting, detailed scrutiny of industry funds, bank product pricing, the fee structure of IPOs, fee calculations, rates paid on cash, the valuation of unlisted assets, performance fees, index-hugging by active managers, risk, the definition of defensive assets, bid-offer prices…to name a few. The bottom line is that this has been a bit of an anti-climax for those looking for some sort of public retribution against the sector. 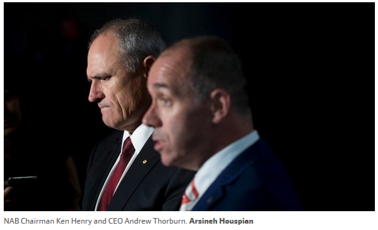 Andrew Thorburn and Ken Henry at the NAB were both named by Hayne and for those who want to see somebody ripped to shreds in the streets, someone to blame, these two (along with 24 other individuals and companies that have been referred breaches of the law) will have to do. Financial planning gets a bit harder – fee arrangements must now be reviewed annually by the client, the services that the client will be entitled to have to be recorded in writing, as do the total of the fees to be charged, and a financial planning business may only ask for the payment of fees that have been agreed with a client's express written authority. I know an insurance salesman who says he is leaving the business because he doesn't have time to contact the clients every year – decades of receiving free money for a product sold years ago has created a very lazy industry – the sooner they are gone the better. Grandfathered commissions will also disappear from 1 January 2021. This really is one of the industry’s greatest rorts, selling products and receiving a lifetime income for doing no work. It also creates the situation that means a financial adviser doesn’t want clients to ever sell a product even if it’s inappropriate, because they lose the trail. No wonder the "Buy and hold" culture is so developed – it is in the industry's interests not the clients. Fake independence – The law should be amended to say the financial advisor would contravene the corporations act by assuming or using any of the restrictive words or expressions including independent, impartial, and unbiased, and must, before providing personal advice to a retail client, give them a written statement explaining simply and concisely why an advisor is not independent impartial and unbiased. "Independent" financial advisers revealed at last. But you cannot combat culture with regulation. The bank sector culture will change when a bank executive says, behind closed doors, “We can’t do that” and the Hayne commission has gone a long way to creating the moment for that executive to change that culture. There is now a fabulous business opportunity for a bank to lead on culture. It will take a bold and probably unprofitable move but there are now literally millions of disillusioned bank clients on the move that will gravitate towards whoever takes the cultural lead. It is like picking up rubbish on a running track. One person picks up a beer can, carries it for 500 yards, dumps it in the bin, is seen by everybody else, and before you know it, everybody is picking up beer cans, there is no litter and everyone is proud of their running track. Culture changes with one small act. It is in the hands of one individual, in one bank, to act and, in so doing, effect the culture change. Individuals need to take some responsibility for their financial outcomes. They can only do that if they come up the curve on financial literacy. My son Archie has chosen money markets and business as VCE subjects and as a result is inquisitive and informed and in a position to plan his financial future. Perhaps the government should include financial literacy as a standard syllabus subject and perhaps the individual should stop expecting that when it comes to finance they need their hand held like a baby. Perhaps I need to run mass classes on subjects like “Your Super – where is it and what are your options”. In the end, for all its deficiencies, for the apparent lack of retribution, the Hayne commission has gone a long way, with limited time and resources, to changing the bank and insurance industry culture and has certaintly, surprisingly, highlighted some significant issues of client abuse that were to this point unearthed. They have to be congratulated for that. This is a step in the right direction. But it will still take individuals within the bank, insurance and financial planning industries to make individual decisions that change the culture. No one can force them to do that, they have to want to do it. Abusing the clients is so 2018.